Canucks fans are excited. 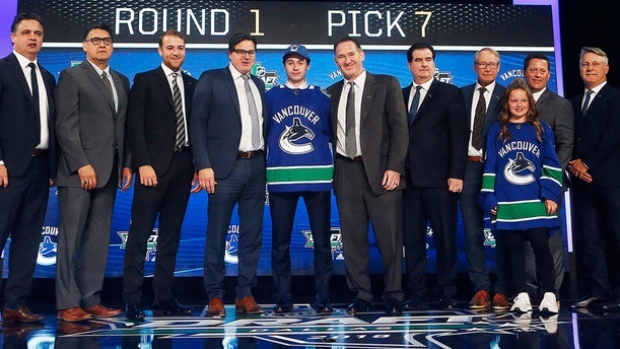 They got to watch Elias Pettersson all season long shine and that just makes them hungrier to watch their next prospect and that would be defenceman Quinn Hughes. He had the foot at the end of his collegiate season. How much will he get to play in Vancouver this season? McKenzie: We'll probably know better in the next 48 hours. Obviously, Canucks fans are very excited about Hughes. A dynamic offensive defenceman, they want to get him in the lineup as soon as possible. But he did block that shot. Over the next 48 hours, he is going to get another CT scan and see where they're at. They do expect that he will play games this year, they just don't know how many. He's not expected to play Wednesday. That would give him eight possible games after Wednesday that he could play in. I guess on the bright side, he can't play 11 or more games which would have made him eligible for the Seattle expansion draft, and he can't play 10 or more games which would give him salary-arbitration rights and the ability to get offer sheets when his entry-level contract expires. So it might be the perfect situation to bring him in, play him eight or less games, have a look at him and protect the club's best interests by not having to protect him or giving him salary-arbitration rights. Six-foot-6 prospects turn heads. Six-foot-6 prospects who score 61 goals get scouts salivating. So, all eyes on North Bay? 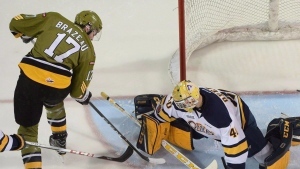 Dreger: No question about that and the young guy, 21-year-old by the name of Justin Brazeau. He scored 61 goals in 68 OHL regular-season games. He's undrafted so he is drawing NHL attention and there are at least five-to-seven teams in the mix. The Toronto Maple Leafs have expressed some interest. Boston, St. Louis, Nashville, Vegas, Columbus – they are all intrigued by him. In a perfect world, one of these teams would get him signed to an American Hockey League contract, but when you've got those numbers and you're going into the playoffs, then obviously he is looking for an NHL deal. So there will be five-to-seven teams at Thursday's game when they open the playoffs against Niagara. Tampa Bay Lighting clinching the Presidents' Trophy already. When you've done that and you've got nothing left to play for and there are still three weeks left in the season, how do they handle that? LeBrun: Well they don't want to get out of a rhythm. So you start with the goalie, Andrei Vasilevskiy. It was in March a year ago where you may remember he was quoted as saying he was tired. It was an interesting quote. Well, that's not the case this year. He's certainly more used to being a No. 1 goalie in his second full year as a starter. And he missed five weeks earlier this season which gave him that rest. So they're not worried about his rest. 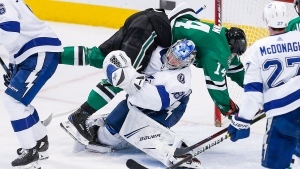 In fact, the priority for Jon Cooper is to make sure that Vasilevskiy stays sharp down the stretch. Yes, Louis Domingue will play, but they'll want to keep their No. 1 goalie sharp. Overall as a team, the Lightning finish in Montreal, Boston and Toronto. Maybe there is some rest, but it depends on the playoff races involving those teams. NCAA signing season. We've had that but U Sports has some top-quality hockey players and we might see one of them on the Calgary Flames at some point down the road? McKenzie: That's correct. 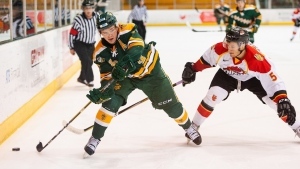 Luke Philp of the University of Alberta Golden Bears. He was the U-Sports player of the year in university hockey. A two-year entry-level deal with the Calgary Flames. Now, it was a tough weekend for the Golden Bears and Philp. Philp suffered a high-ankle sprain in the University Cup. The Golden Bears did not win the championship. But nevertheless, the Calgary Flames like what he can bring. A 23-year-old who played for Kootenay and Red Deer in the WHL. His entry-level contract kicks in next year. Dreger: The NHL officiating department is also looking at USports and to some degree the NCAA for both male and female potential officials. They're looking at seniors, but they've got an exposure combine coming up in August in Buffalo. And, obviously, they'd like to add a female on-ice official. They've got their application process open for the next couple of weeks at the NHL level. I'm told they don't have a specific number of women that have applied, but they've got more than ever. So it looks good, and in fact, imminent that a woman NHL official will be on the ice at some point soon. Future of the front office in Carolina? LeBrun: It was a year ago this month that the Carolina Hurricanes removed Ron Francis as GM that led to a two-month search and a bunch of interviews for a GM. And then they named Don Waddell GM from in-house. That was never meant to be a long-term appointment, but he's still GM and the question is for how long? He's the team president and he has a lot of functions for that organization. He's a busy guy. 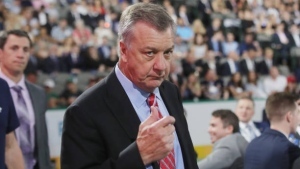 Tom Dundon, the owner of the team, told me today at the end of the season that he will sit down with Waddell. They will discuss the future and figure out what's right at the GM position and beyond.